When you’re out stomping Goombas, running down pieces of the Triforce, or dodging barrels lobbed at you from a giant tie-wearing gorilla, you need the right footwear. And now, thanks to a partnership between Vans and Nintendo, you have it. The iconic skate shoe brand and legendary video game maker have teamed up on a line of gear featuring some of the most popular game characters of all time. Mario, Link, Princess Zelda, Yoshi, Bowser, Donkey Kong, and other characters from Super Mario Bros., The Legend of Zelda, Donkey Kong, and Duck Hunt have been plastered all over sneakers, shirts, hats, t-shirts, sweatshirts, flip-flops, and backpacks. 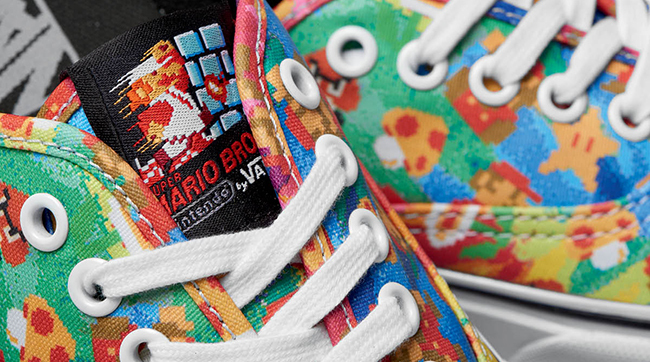 There are even sneakers inspired by the original Nintendo Entertainment System and its controllers. The Vans x Nintendo Classic line is available in both kids and adult sizes and launches June 3. But we have your first look today!